Epiphyllums (Epis) are a genus of epiphytic cactus. The genus is made up of sixteen species. Epiphytes grow on other plants, specifically trees, but they do not derive their sustenance from that plant. In other words, they are not a parasitic plant, they are just there for the ride. Many orchids, bromeliads, and some ferns are also epiphytes. 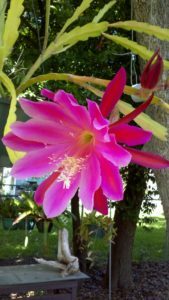 Some Epis are referred to as “Cereus” by hobby gardeners, with the Night-blooming Cereus(Epiphyllum oxypetalum) being the most famous. This has led to some confusion. In reality, true Cereus are terrestrial plants, not epiphytes. But, as is common in nature, there are members of each family that just refuse to follow the rules. There are some species of Epiphyllum that are terrestrial plants and there are some members of the Cereus family that resemble Epis. Other Cereus are columnar cactus that look nothing like Epis. In addition, there are several related genera that have been lumped together by casual hobbyists and even by some serious collectors. They all have “hand-me-down” names that are widely accepted and few people seem concerned to correct it or sort it all out. To make matters worse, taxonomists have recently moved some of them around to other genera. Taxonomy is a fickle sport. For the purpose of this article, we are describing the care of true Epiphyllums and Epi-like cactus that are treated like Epis by collectors. We are going to leave the nuts, bolts and debates to scientists and collectors. When selecting Epis, or when accepting a pass-a-long, the time of day it blooms can help narrow it down. The species are night-bloomers and any day-bloomer is a hybrid. Epis are not difficult to care for. They like filtered light, a well-drained potting soil, a pot that allows them to stay slightly root-bound, and regular fertilization. Epis do well in hanging baskets. A hanging basket is close to their natural habitat as long as attention is paid to their soil environment. Drainage is important to maintain a healthy specimen. Adequate drainage is a combination of the container and the potting media. Hanging baskets made of plastic can be used successfully. If additional drainage is needed, it is easy to add extra holes to the sides of the baskets using a ¼” drill bit or the tip of a soldering iron. You can also use wire baskets lined with coco-mat or with long-fiber sphagnum moss. Small Epis will do well in terracotta orchid pots, which are designed to increase drainage and provide good soil aeration. The potting mix should be light and well-drained. Their natural habitat is decomposing leaf litter in trees and the crevices of rocks so standard peat-based potting mix right out of the bag is not recommended. It’s too dense and it is nutrient poor. If I use a peat-based potting soil I prefer to modify it by adding additional perlite and leaf mold compost at the rate of 3-2-1 (3-parts potting mix, 2-parts perlite, 1-part leaf mold compost). The perlite aids with drainage and aeration and the leaf mold compost replicates the natural root environment of many Epis. If you have a tendency to over water, use a looser mix. 4-parts potting mix, 2-parts leaf mold compost, 2-parts orchid bark, and 1-part perlite. Lately I have been using equal parts orchid mix and leaf mold compost with success. The orchid mix I use has ½” – 1” bark and some lava rock. You can choose to add nutrients to the mix in granular or powdered forms, but be careful with the amounts. I generally prefer to fertilize when I water. Epis can easily be killed by overwatering. The soil needs to be allowed to dry a bit between waterings. The first inch or two of soil should be dry to the touch, but the soil should not be allowed to dry completely or the small feeder roots may die off which will affect blooming. During their winter rest it is very important to NOT over water. Epis do not go dormant, but they do stop growing actively. At this time they will require much less water than they did in the spring and summer. Use your finger to test the moisture in the media, or push a pencil in about 2”. If the wooden tip is moist, do not water. If it is dry, apply just enough water to moisten the media, but not enough to be dripping out of the container. Epis will grow and bloom well if they are fed regularly. On the Gulf Coast they should be fed every two weeks from February through November with a half-strength cactus fertilizer. If you prefer you can also use Microlife or Arbor Gate Blend, but use half as much as the instructions suggest for the container size you are using. Epis should be fed from Feb – October. In November it is beneficial to use a root stimulator only. Do not feed in December and January. Epis can take cool nights. In fact, they seem to really enjoy them. Buds are formed when nights are cool and the long – the winter months. But they cannot withstand frost and freezing. Epis should be moved into a greenhouse, or other protected area, for winter before the nights are consistently in the 40’s. They can be kept in an unheated garage if they are provided sufficient light and as long as the temperature does not reach freezing.